Monsef, A., Farshchian, M., Jafari, M., Farshchian, M. (2012). Immunofluorescence Pattern of Autoimmune Bullous Diseases in Iranian Patients. Iranian Journal of Pathology, 7(4), 231-235. Alireza Monsef; Mahmood Farshchian; Mohammad Jafari; Mehdi Farshchian. "Immunofluorescence Pattern of Autoimmune Bullous Diseases in Iranian Patients". 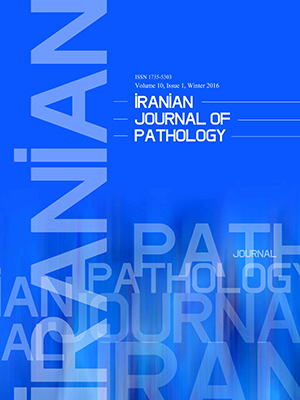 Iranian Journal of Pathology, 7, 4, 2012, 231-235. Monsef, A., Farshchian, M., Jafari, M., Farshchian, M. (2012). 'Immunofluorescence Pattern of Autoimmune Bullous Diseases in Iranian Patients', Iranian Journal of Pathology, 7(4), pp. 231-235. Monsef, A., Farshchian, M., Jafari, M., Farshchian, M. Immunofluorescence Pattern of Autoimmune Bullous Diseases in Iranian Patients. Iranian Journal of Pathology, 2012; 7(4): 231-235. Background & Objective: Autoimmune bullous diseases are associated with autoimmunity against structural components in the skin and mucous membranes. Autoantibodies are against the intercellular junctions in pemphigus disease and hemidesmosomal unchoring complex in pemphigiod diseases and epidermolysis bullosa aquisita. The tissue-bound and circulating serum autoantibodies can be detected with direct immunofluorescence (DIF) and indirect Immunofluorescence (IIF) tests. The aim of this study was to pinpoint the immunofluorescence pattern of Iranian patients with autoimmune bullous diseases. Methods: In a prospective case series study, sixteen patients with autoimmune disease enrolled in the study for two years. Perilesional skins and sera from the patients were used in DIF and IIF for detection of immunofluorescence pattern. Results:Out of 16 cases, 9 cases had pemphigus and 7 cases had bullous pemphigoid. All cases of pemphigus had positive DIF in intercellular region with lacelike pattern; IgG was detected in all cases, IgA in 1(11.1%) case and C3 in 3 (33.3%) cases. One (11.1%) case of pemphigus had positive IIF in intercellular region with lacelike pattern; circulating autoantibodies were IgG and IgA. All cases of bullous pemphigiod had positive DIF in dermal-epidermal Junction with linear pattern. IgG was detected in all cases, IgM in one (14.3%) case, and C3 in six (85.7%) cases. One (14.3%) case of bullous pemphoid had positive IIF in dermal-epidermal Junction with linear pattern; circulating autoantibody was IgG. Conclusion: Immunofluorescence tests are sensitive diagnostic methods for autoimmune bullous diseases. IIF positive cases in our study were lower compared to the previous reports. Mihai S, Sitaru C. Immunopathology and molecular diagnosis of autoimmune bullous diseases. J Cell Mol Med 2007;11(3):462-81. Razzaque AA. Diagnosis of bullous disease and studies in the pathogenesis of blister formation using immunopathological techniques. J Cuetan Pathol 1989;11(4): 237-48. Elder DE, Elenitsas R, Johnson BL, Murphy GF. Lever's Histopathology of the Skin. 9th ed. Philadelphia:Lippincott Williams and Wilkins;2005. Henry JB. Clinical Diagnosis and Management by Laboratory Methods; 21th ed. Philadelphia Elsevier;2007. Fine JD, Neises GR, Katz SI. Immunofluresence and Immunoelectron Microscopic studies in cicartrical pemphigoid. J Invest Dermatol 1984;82(1):39-43. Rosai J, Ackerman LV. Ackerman Surgical Pathology. 9th ed. New York:Mosby; 2004. Kumar V, Abbas AK, Nelson F. Pathologic Basis of Disease. 7th ed. Philadelphia: Elsevier;2005. Tan T, Ratnam KV. Immunoflurescence studies of pemphigus and pemphigoid in Singapore. Ann Acad Med Singapore 1983;12(1):13-8. Weigand DA, Clements MK. Direct immunofluorence in bullous pemphigoid: effects of extent and location of lesions. J Am Acad Dermatol 1989;20(3):437-40. Kirtsching G, Wojnarowska F. IgA basement membrane zone autoantibodies in bullosa pemphioid detect epidermal antigens of 270- 280 K Da, 230 K Da, and 180 K Da molecular weight by immunoblotting. Clin Exp Dermatol 1999; 24(4): 302-7.